Wow this town really blows me away! We have a brilliant wee town and the folks are so generous! Less than an hour since I posted up and we had reached our total!!!! THANK YOU ALL SO MUCH! I am hoping that some of you kind people can assist us in our latest project! We have a shortfall in our budget for this weekends remembrance event and are looking for your suggestions in how to cover the gap. 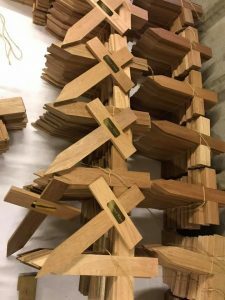 We arranged for 398 wooden crosses to be made by Fairholm Joinery, they very generously provided the material and labour to make the crosses, Timpsons in Falkirk very kindly made individual name plaques and done so at cost, however this still cost £2 per plaque so £792 in total, our project team has spent the last week varnishing them all and fitting the name plaques. We have had fantastic donations from Bo’ness True Blues of £200 and a £250 donation from BRAAS (Boness Real Ale Appreciation Society). So we have a current shortfall of £342. I am looking to approach local Bo’ness business to see if they would be interested in helping to raise the shortfall, if anyone on here is in a position to assist it would be very much appreciated. The budget we raised for the project through the HLF did not have a contingency to cover this additional 100year remembrance event, thus why I am here asking for assistance.